This week we decided to observe how we spend our time, and we focused on our schedule: mapping our (productive!) activities. I collected every single task I performed during the week: emails sent, skypecalls, meetings, problems I solved, talks delivered, projects reviewed and so much more. I didn’t focus only on strictly work-related tasks but I also collected those daily (boring!) duties that one has to do regarding home, administration of personal life and so on. I additionally noted if I was doing my task alone or with somebody. As many other times I also collected attributes I didn’t end up representing (such as where I was and which device I was using) because honestly they didn’t really add anything to the story of my week in the end. But anyways, my days are really split among very different kind of activities for small chunks of times. I wanted the aesthetics to govern my choices for once, especially because I couldn’t find lots of interesting patterns in the data, in the chronological flow of time and tasks. In fact, the most interesting thing to me was to simply represent how many things I do and how different they are, how really made of mixed tasks my week is (as I assume most of everybody else’s is.). I wanted to compose a beautiful abstract drawing with data, a composition that could reflect this cocktail-mix of varying activities. I’ve always been fascinated about abstract art, about the aesthetics of those colored, floating and overlapping elements in abstract paintings. I mixed pens, pencils and markers, I mixed plain shapes with more unconventional ones, I used some letters as well, as if I had to compose a futuristic poster of my week of tasks. I actually like the result very much, this is one of my favorite postcards of mine! As I wrote on the legend: "the position and rotation of the elements are absolutely random and direct function of the esthetic composition I wanted to create". I know there would have been more rigorous and straightforward ways of organizing the data in the space of the postcard, and I usually spend a lot of time figuring out the best principles to arrange my data spatially; but this time I gave myself the freedom to experiment a bit more. In my daily job at Accurat, I like to think of our data visualizations as engaging ways to convey visually the richness of the stories we find in the data we analyze. And - sometimes - the aesthetic elements of a data-visualization can be considered as important as the data itself in getting readers interested about a topic, leading them to shape an understanding of it and triggering their curiosity to explore more. In some cases, a beautiful and functional data-visualization may not necessary take its shape only from the data, but purely visual choices can play a comparable role in its success. Hey, I know that beauty cannot replace functionality, but beauty and functionality together achieve incredibly greater results! Anyway - I guess this is part of the game since every week we only want to establish the topic, without giving rules about the kind of data we would collect! 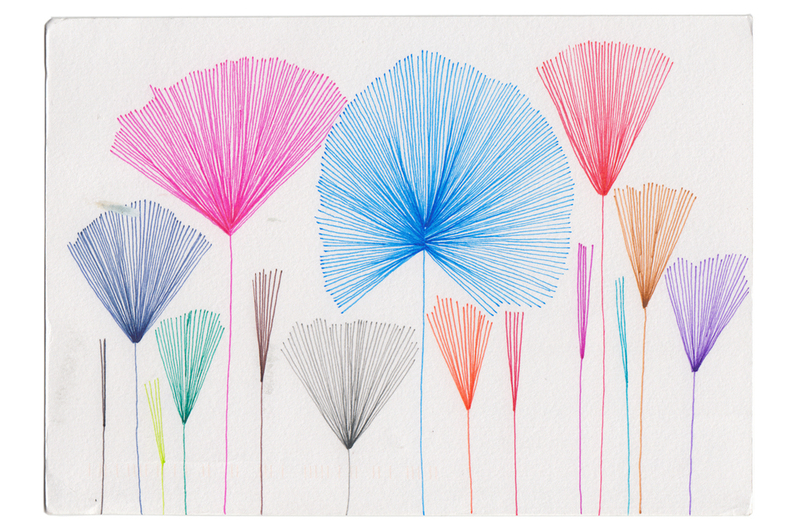 Stefanie’s postcard is so precise and elegant! I love to look at it and picture her days in my head. Here, I gathered every minute of my schedule: every way that I spend my time during the entire week. I did this all manually in a small notebook even though there are apps that I could have used… I’m not sure why, I guess I like to make things difficult for myself. As I’ve mentioned in previous weeks, I have funny sleeping habits and I always feel like I don’t get enough sleep, always assuming I only get 6 hours of sleep or less an evening. So, while I know this is just a week’s worth of data, I’m surprised to see that I get more sleep than I previously thought. But of course, how many grand conclusions can you draw from a just one week? For example, I normally don’t spend so much time preparing and eating meals socially, but this week I held an incredibly-belated Thanksgiving dinner for my friends in December that made an impact on this part of the dataset. This project is an interesting one, because of course it’s not meant to be a rigorous, academic data-gathering exercise. And yes, one can’t draw grand conclusions from a week’s worth of data. However: there’s still value in these week-long experiments in gathering data, if only due to how the act of data-gathering makes one notice and interrogate their life more closely. Anyone who has seen my other projects knows that I make tons of data visualisations that have a plant-based shape like this. I guess I wanted to find a way to incorporate this type of drawing into a card because I have fun drawing these linear, radial shapes. However, I think I need to try to be a little more experimental with the visualisation methods that I’m using. And the red annotations highlight other mistakes: I also messed up this card by crossing out my husband’s name, as I’m trying to offer him some privacy, though I’m not very even-handed with this (as you’ll see in later cards). Also, I tend to always mess up my card through smudging the ink: I’m left-handed, and it drives me crazy that after spending ages drawing a card I end up smudging it in the final stages. I think that our Dear Data project is one that is hard to define, as depending on the week, and depending on the data, the emphasis is slightly different. I've found that as this project has developed I've become more interested in the aesthetic side of things because it feels different than my day job as well. This set of small weekly experiments is offering us a chance to explore ideas that work (or don't work) away from the rigorous analysis and critique given to fully-fledged data visualisation projects. It took 4 tries to get this card right ... and no postbox photo this week: it seems I completely forgot!